We created Tanda with the goal of simplifying the way you make your business’ weekly rosters. From pen-and-paper or Excel spreadsheets, Tanda’s rostering software lets you build rosters quickly and accurately. It lets you drag and drop shifts to your pre-set templated rosters. It also lets you see how much your roster is going to cost as you build it. More than that, Tanda can notify staff of upcoming shifts in seconds through SMS and email. Spending less time making your weekly roster means spending more time on what matters most: your business. And here at Tanda, we are constantly making strides in helping you achieve that goal. That is why we are excited to announce that starting today, you can copy and paste rosters on a weekly and daily basis! The Benefits of Copying Weekly Rosters Having this new feature gives Tanda users tons of possibilities with regards to their roster building: Eliminates the need to recreate an entire roster per week — Now, you can copy an existing weekly roster and modify it accordingly. Use old rosters as templates — You can copy an old roster from any week and use it especially for special occasions such as three day weekends, the holiday or Christmas season, as well as sporting events such as the State of Origin series Easier roster rotation — Copying rosters makes it easier for managers to rotate rosters with normal working hours are spread over four weeks. Quicker fortnightly rostering — With the copy rosters feature, businesses using fortnightly rosters can easily copy the first week’s roster to the third week and then the second week’s roster to the fourth week. Rostering Just Got Better! Previously, you have to spend some time every week manually building your business’ weekly roster. The only thing you can copy and paste are shifts. But now you can speed up your roster-building process by copying rosters. From your current weekly roster, you can go to Tools > Copy to next week and this week’s roster automatically duplicates for next week. You can also click Tools > Copy from previous week to duplicate last week’s roster to this week. We also made it possible for you to copy a single day’s roster. You can do so by clicking the settings cog beside the date of the roster and click Copy shifts between days Copying rosters can also be done for different weeks. 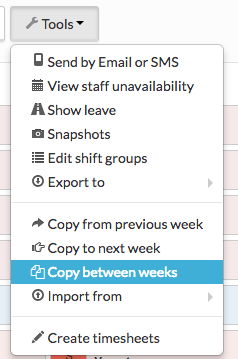 By going to Tools > Copy between weeks, you can copy a previously accomplished weekly roster to an upcoming week. We’re simplifying it further by allowing you to automate the entire process. You can do this by going to the settings cog on the upper right-hand corner and click Settings > Notifications & Tasks > Schedule Tasks. From there you can click Copy Rosters to Next Week and it will automatically copy over your weekly roster at 9 AM the day before the next roster begins. Existing users can click here to learn more on how to copy rosters in Tanda. Are you a new user? Signup for free here to use Tanda to build better rosters for your business, and so much more. We created Tanda with the goal of simplifying the way you make your business’ weekly rosters. From pen-and-paper or Excel spreadsheets, Tanda’s rostering software lets you build rosters quickly and accurately. It lets you drag and drop shifts to your pre-set templated rosters. It also lets you see how much your roster is going to cost as you build it. More than that, Tanda can notify staff of upcoming shifts in seconds through SMS and email. Spending less time making your weekly roster means spending more time on what matters most: your business. And here at Tanda, we are constantly making strides in helping you achieve that goal. That is why we are excited to announce that starting today, you can copy and paste rosters on a weekly and daily basis! Eliminates the need to recreate an entire roster per week — Now, you can copy an existing weekly roster and modify it accordingly. Easier roster rotation — Copying rosters makes it easier for managers to rotate rosters with normal working hours are spread over four weeks. 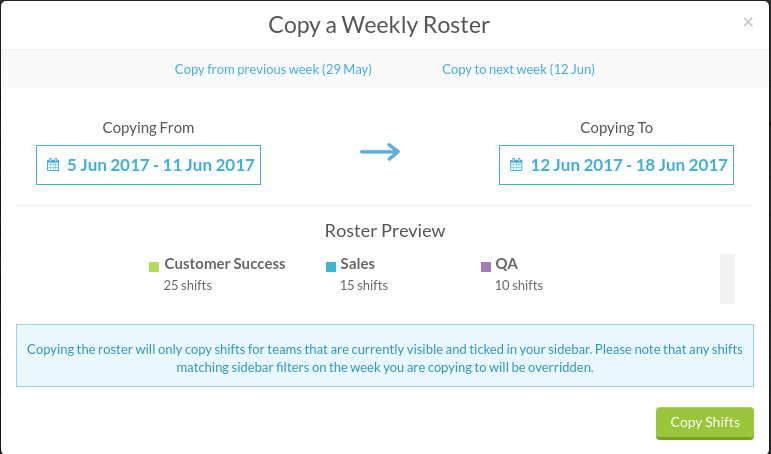 Quicker fortnightly rostering — With the copy rosters feature, businesses using fortnightly rosters can easily copy the first week’s roster to the third week and then the second week’s roster to the fourth week. Previously, you have to spend some time every week manually building your business’ weekly roster. 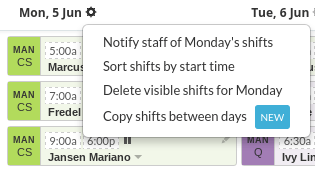 The only thing you can copy and paste are shifts. But now you can speed up your roster-building process by copying rosters. From your current weekly roster, you can go to Tools > Copy to next week and this week’s roster automatically duplicates for next week. You can also click Tools > Copy from previous week to duplicate last week’s roster to this week. We also made it possible for you to copy a single day’s roster. Copying rosters can also be done for different weeks. 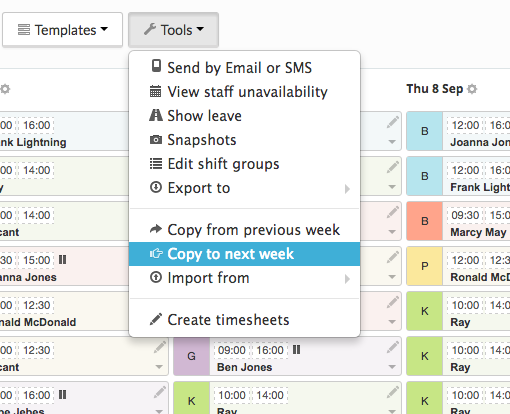 By going to Tools > Copy between weeks, you can copy a previously accomplished weekly roster to an upcoming week. We’re simplifying it further by allowing you to automate the entire process. You can do this by going to the settings cog on the upper right-hand corner and click Settings > Notifications & Tasks > Schedule Tasks. From there you can click Copy Rosters to Next Week and it will automatically copy over your weekly roster at 9 AM the day before the next roster begins. Existing users can click here to learn more on how to copy rosters in Tanda. Are you a new user? Signup for free here to use Tanda to build better rosters for your business, and so much more.